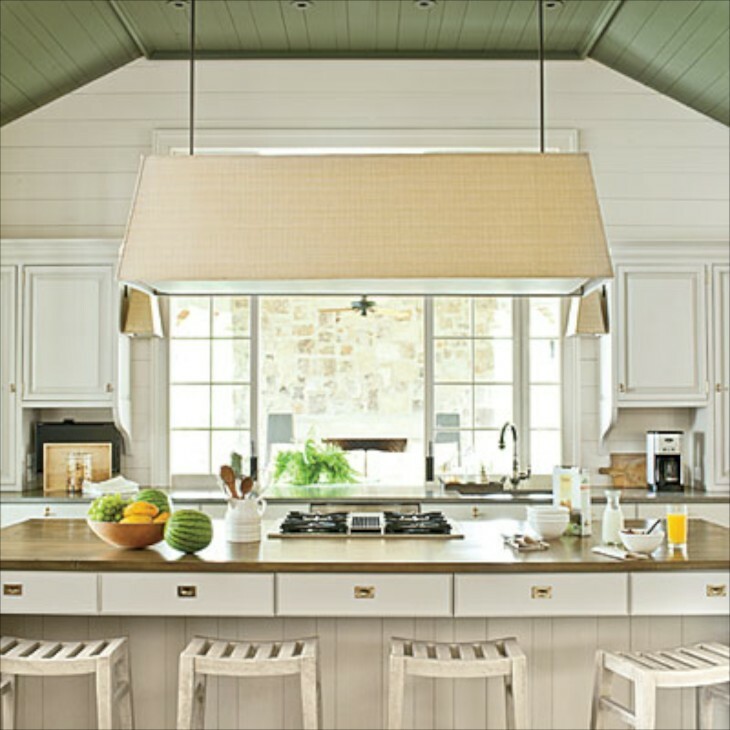 Southern Living Magazine selects various projects of Southern architecture and design in varying categories for yearly recognition. 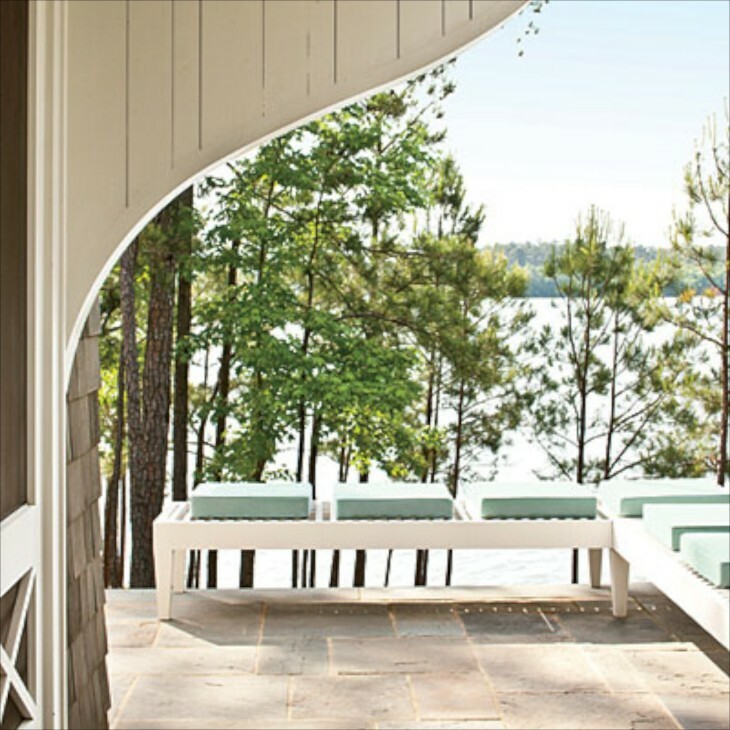 Architect Bill Ingram of Birmingham, Alabama won this year for Best New Home for a home on Lake Martin, Alabama that hardly looks like new construction. 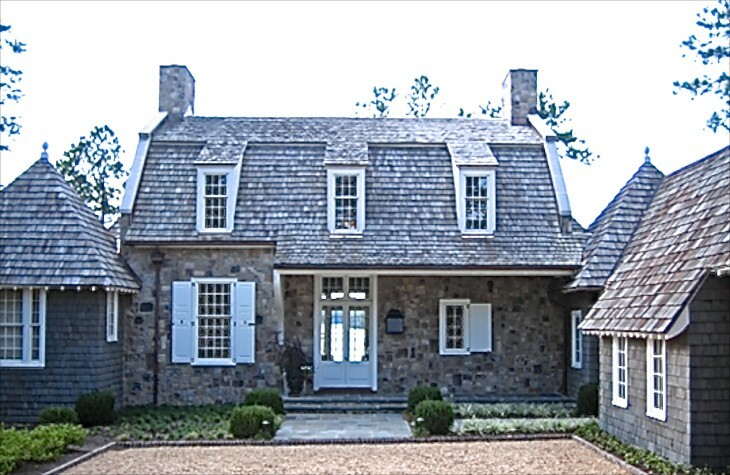 I love shingle style, but have long admired the stone homes and cottages throughout the east, especially in Bucks County, PA, so when I came across this home I was excited to feature it for many reasons. Every once in a while I would come across Mr. Ingram’s work and say to myself, he does a really, really nice job, and tuck the thought away, until I came across this home and decided I just had to do a post on his work and share his talent with you. The 5,000 sq. 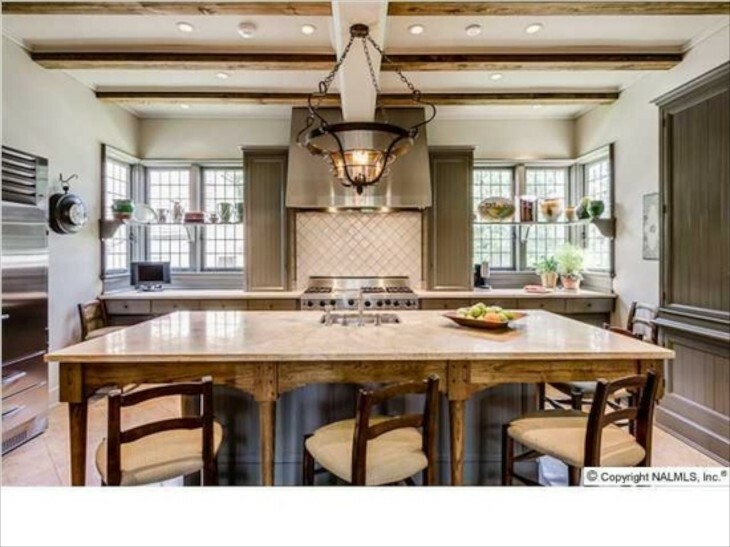 ft. home is designed to take in beautiful lake views, but I can certainly see this home on a knoll overlooking a horse pasture with a wood and stone barn nearby. In fact, although I love lake living, it would be my preference. So on to some photos……. 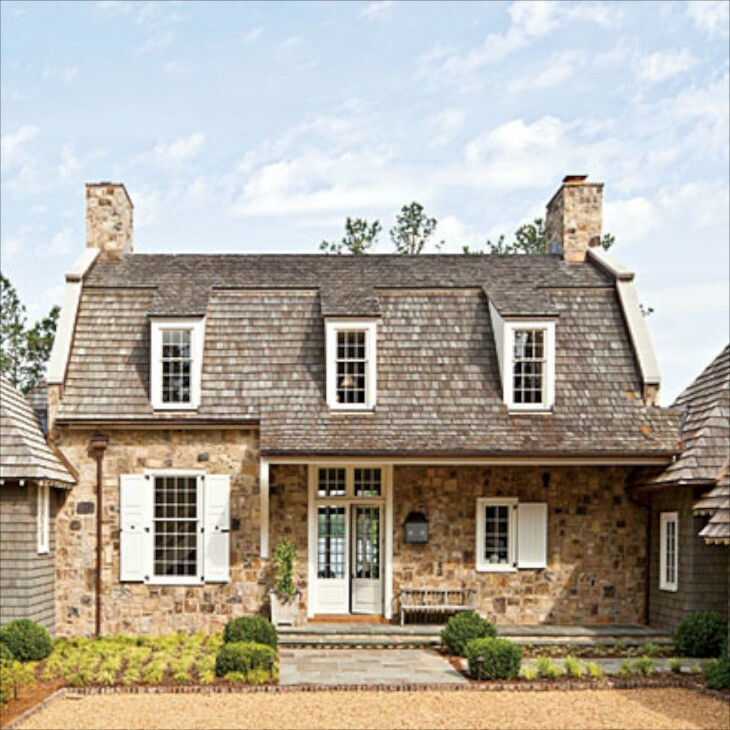 A welcoming facade with a shingled gambrel roof and asymmetrical sized and placed windows. The use of minimal varieties of landscape materials, and keeping them low, allows the homes front entrance to be fully appreciated. Copper gutters add authenticity to the home, and the eyebrow windows are delightful. 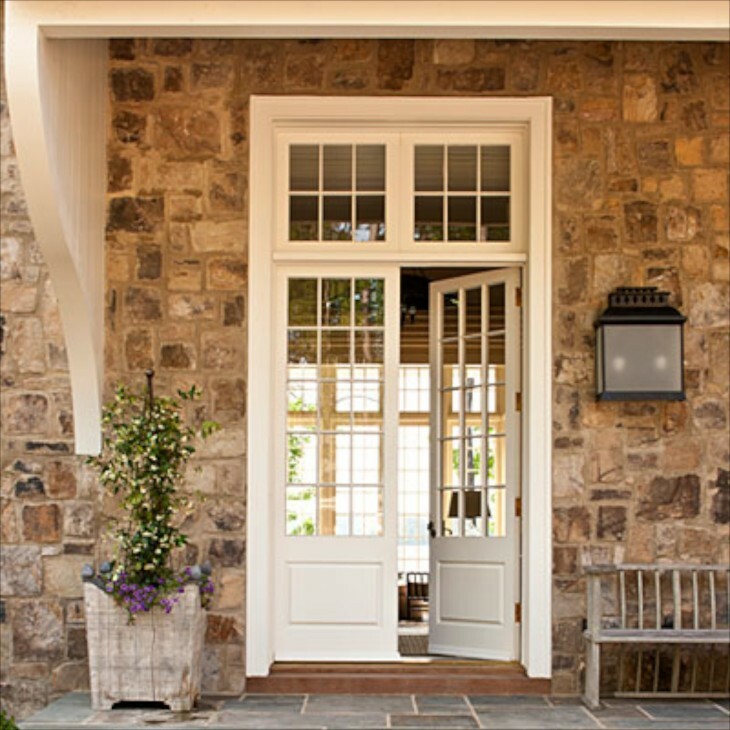 What a wonderful welcome through the French doors with transoms above that allow light to flood the front entrance. 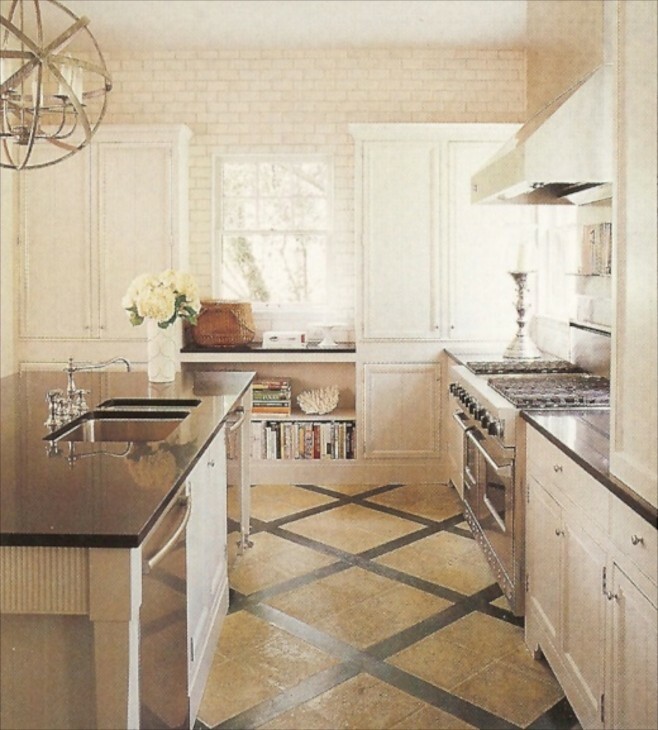 The stone used in the home is quarried in Alabama and it’s use lends a feeling of history and permanence. This foyer and hall is flooded with light. I like the contrast of bright white walls against the stone, and with the open stairs it adds a modern and almost minimalist feel to the space. 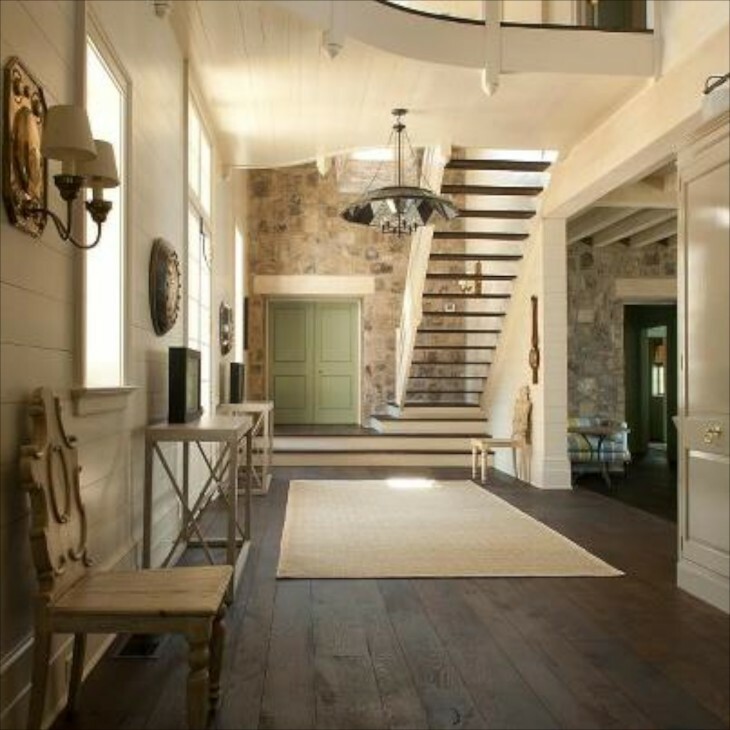 Here is a longer view of the same foyer. 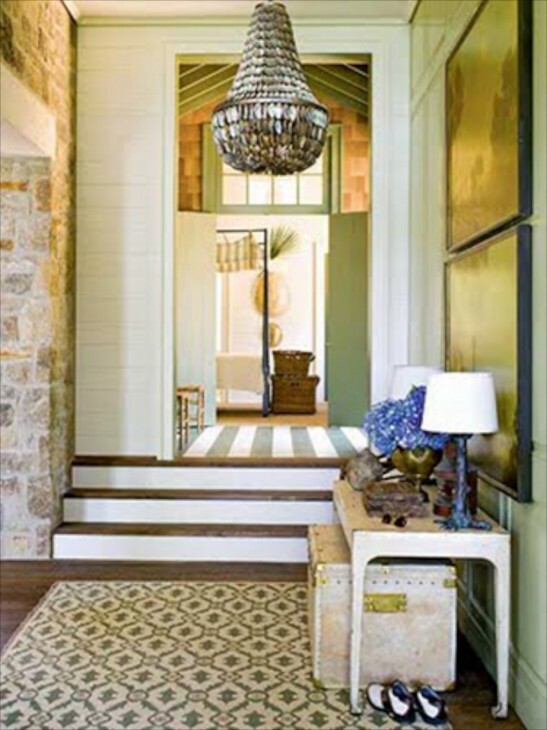 I like the pop of green on the doors, and a color repeated throughout the home. 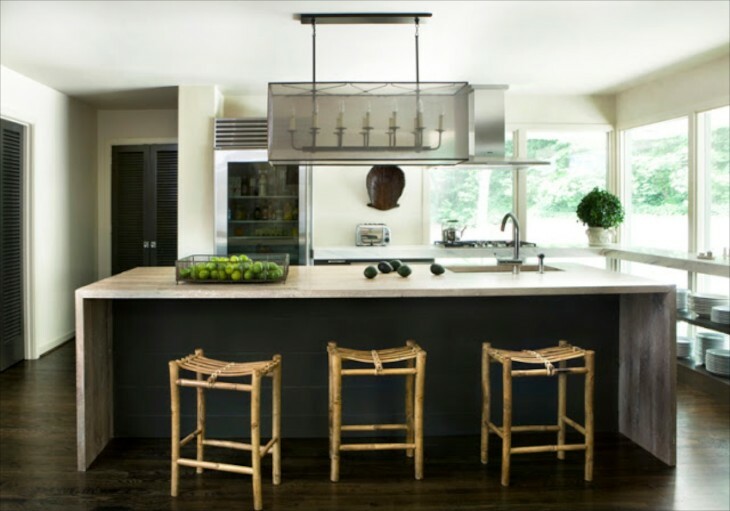 The setting for the home is a wooded lot overlooking the lake, so the green is not altogether unexpected. I was not completely sure that this was a room in the house, but I included it here because it seemed to blend in with the style….. The back of the home shows how the side wings extend also in the back, providing a feeling of enclosure on the back patio. 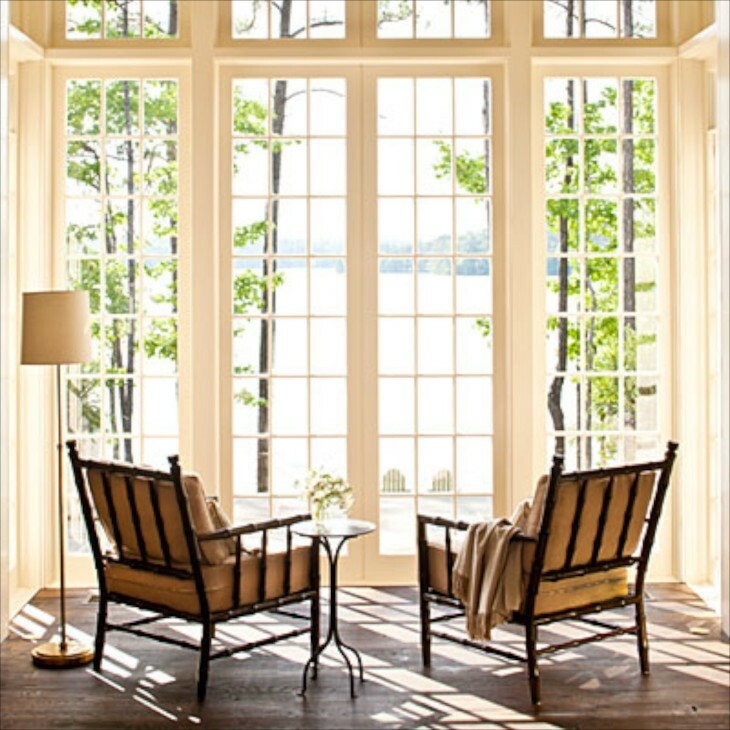 The window filled back allows for expansive views of the lake. From inside, the lake views are expansive as well. 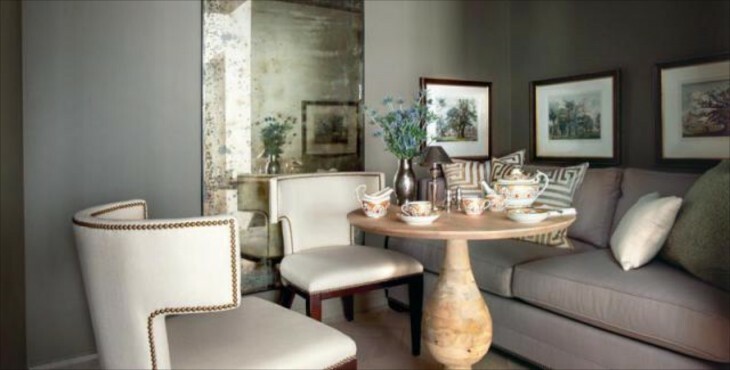 Although the room is large, it feels in scale and sophisticated with the use of neutral colors and comfortable furniture. The kitchen looks out on to another outdoor space. The grren seen on the doors is repeated on the wood ceiling. 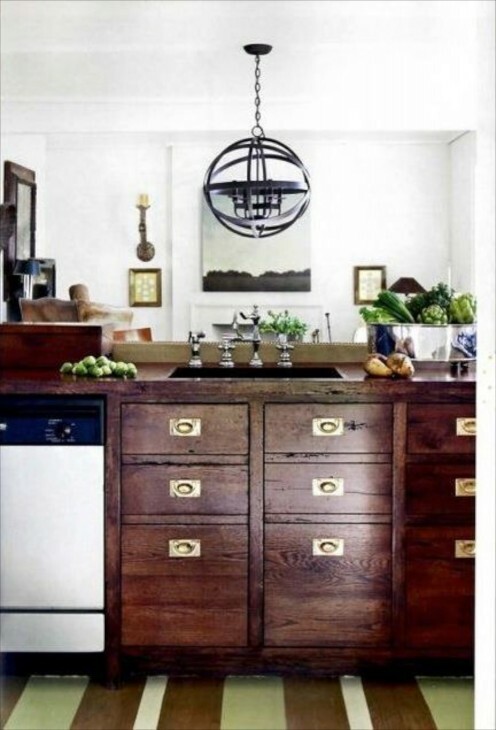 The use of natural material continues with the wood countertop and on the fabric on the island lite. Beautiful copper gutters – who ever says that about gutters? 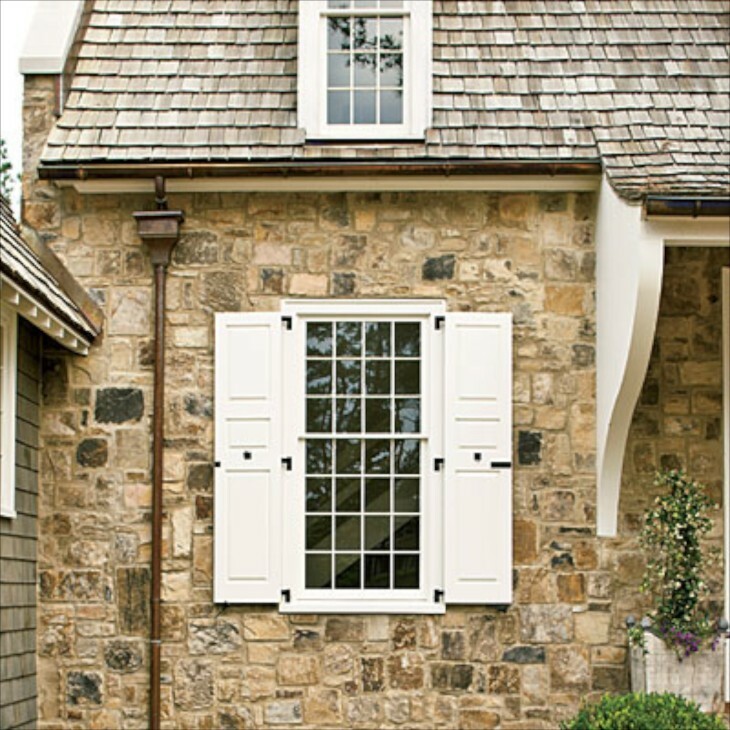 The windows are custom, and the shutters are operable. The walls of the home are 3 ft. thick and the lintel is constructed of concrete. Scale is also important and this six foot support bracket is of the scale needed to balance with the heaviness of the other building materials. I am blown away that there is no rail behind the benches! 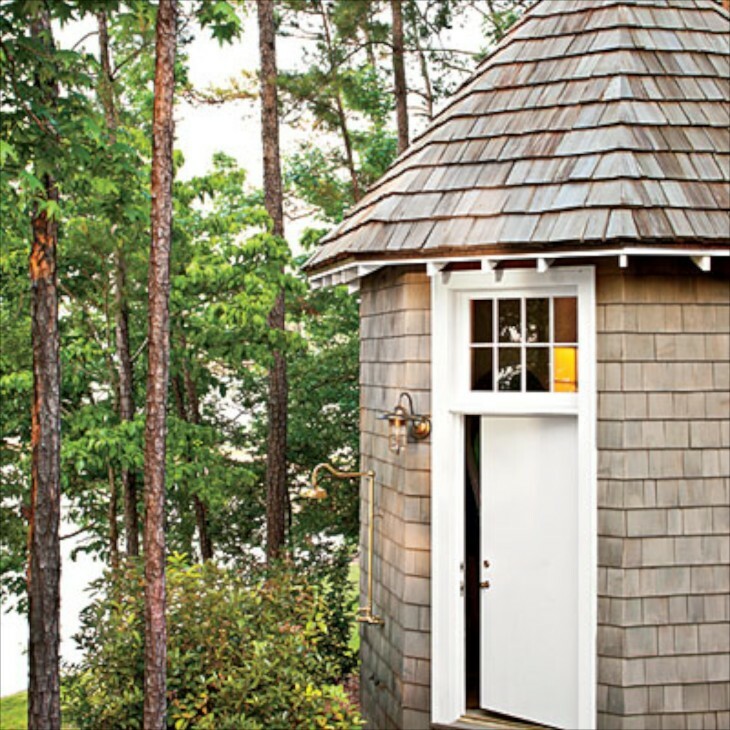 Notice the outdoor shower attached to this French inspired storage house. Back outside where this photo allows for a bit more ability to see the extension off the side of the house, and the view from the front door straight through to the lake. I was able to find more photos of his work that I have long admired, so here we go. Clean and bright, with a contemporary flair. I like the chandelier above the island. 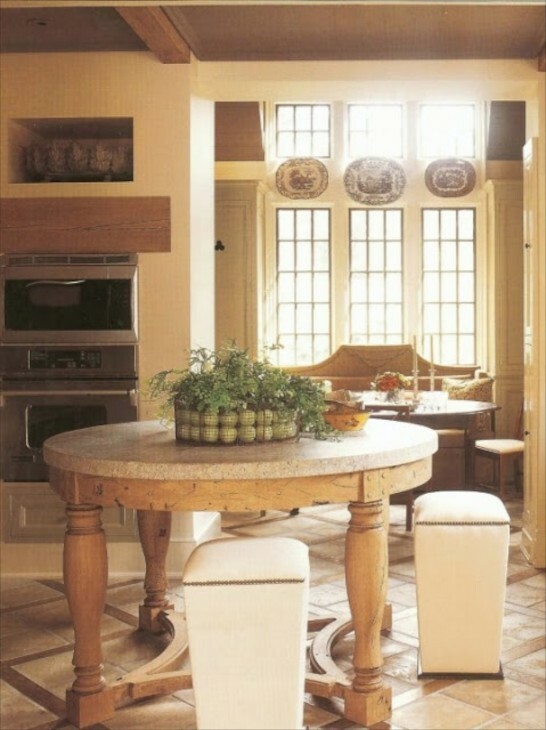 An interesting island-table combination in a large kitchen. 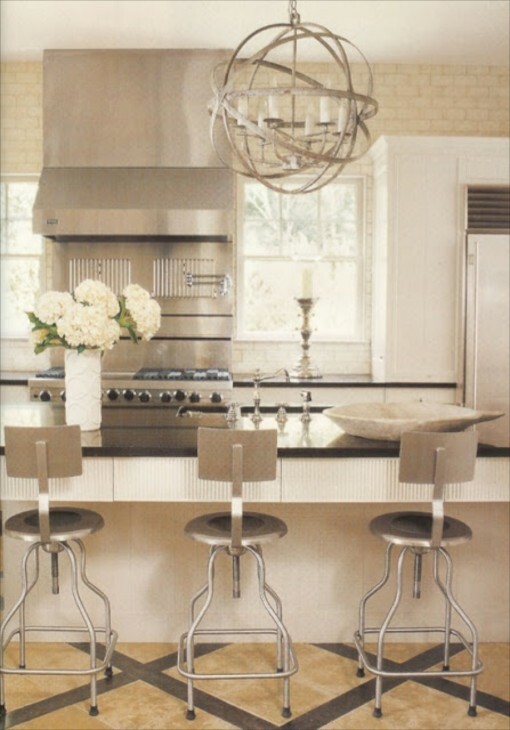 Very interesting choice for the island stools and the tie in directly with the overhead lighting fixture. Cool. I also like the floor. I like built in china storage. A better photo of the floor in the kitchen above. When possible, I am a fan of a door from the bathroom to an outdoor space. Makes a great way to start the day, fresh air and a view of a small garden. What a warm and inviting space. 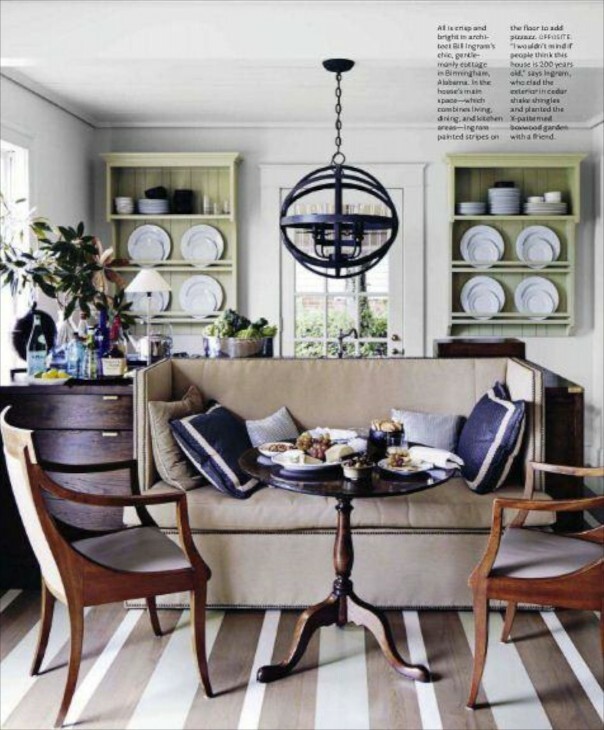 I am loving the table, especially the stools. A staircase like this, with windows and light and a view, can make going up and down the stairs almost a pleasure. 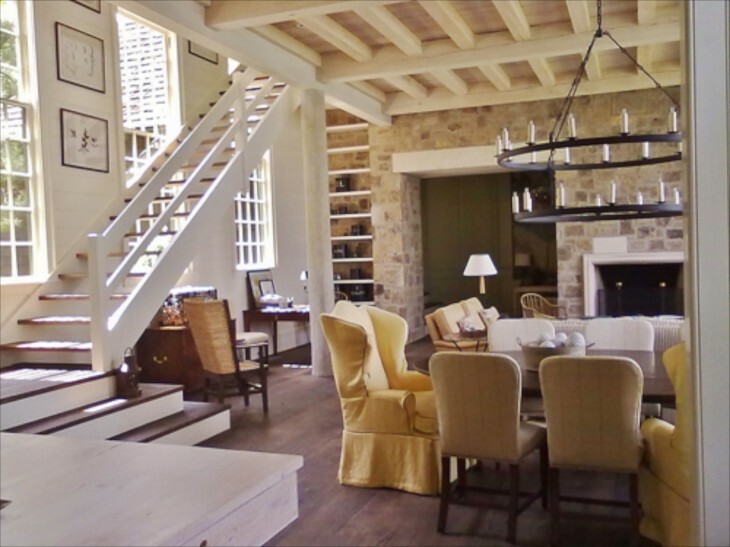 I like to see natural structural elements used in a home, such as the tree trunk, especially if it came from the property. 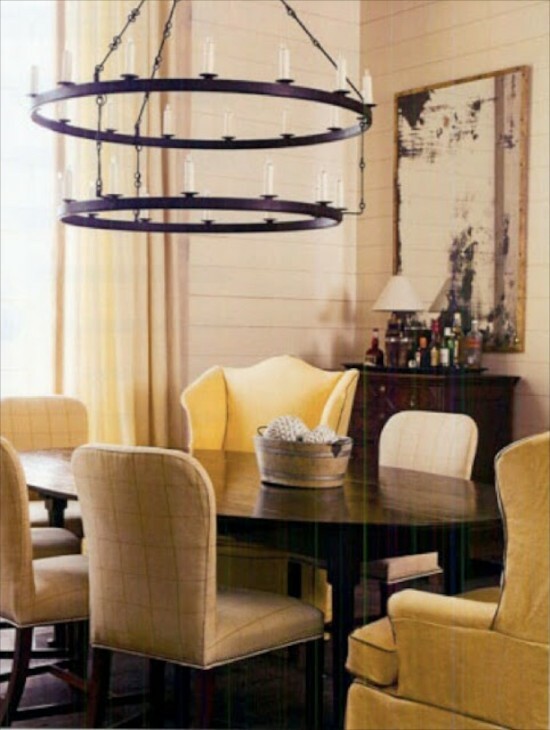 With the soft yellow and creams of the chair fabrics must look even softer at night with the light from the iron chandelier. This fixture is a bit unusual, as the first ring is smaller than the top ring, the reverse of the usual. 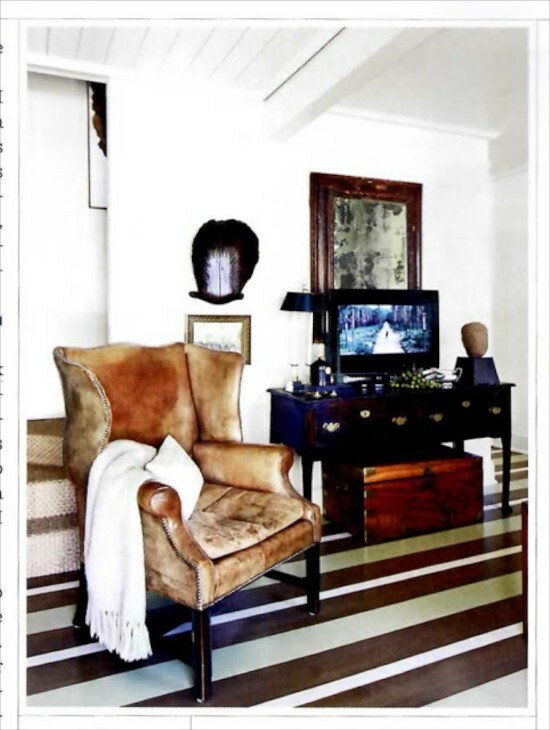 What a terrific floor, with painted stripes….looks like wall to wall carpet! 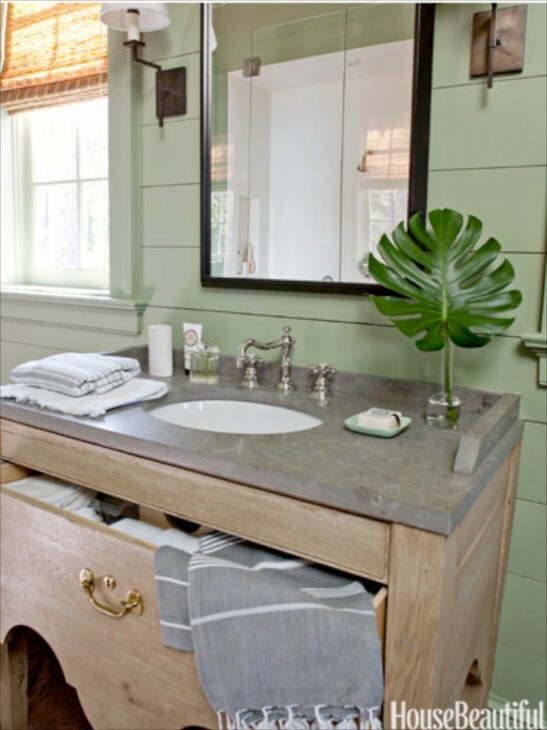 I have always felt that drawers under a sink are much more practical, and are now somewhat more available than only through having them made custom. 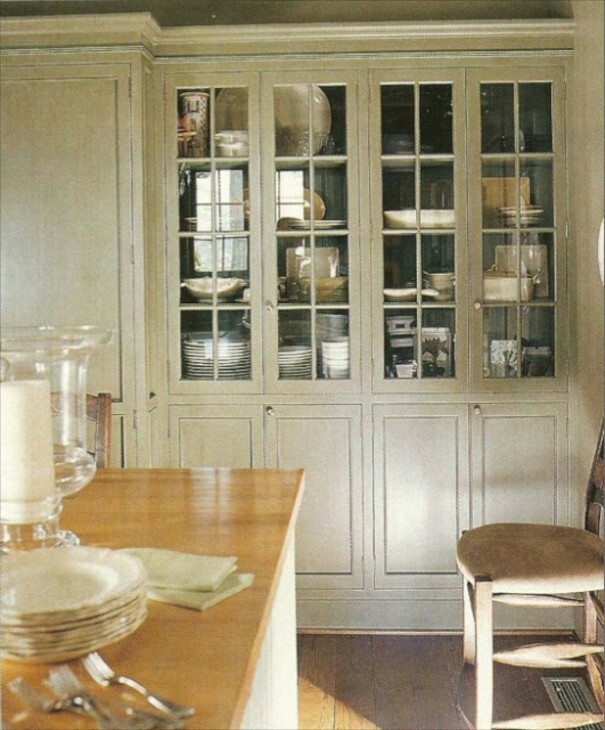 Indeed, I would prefer mostly drawers in a kitchen rather than doors and difficult spaces to utilize. The small sofa built into the back of the island above. Cute. What a pretty and cozy space. Hope your birthday is as fantastic as you are. Wish I was there to celebrate with you. 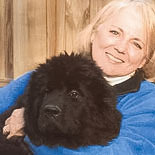 thanks Carole. I wish I could celebrate with friends….would make it so much more exciting! Just a note to wish you a very Happy Birthday. Miss you and hope to see you soon. Thanks for the birthday wish….it really is on friday, but close enough, and I will enjoy your wish all week long! I am so glad you enjoyed the post. 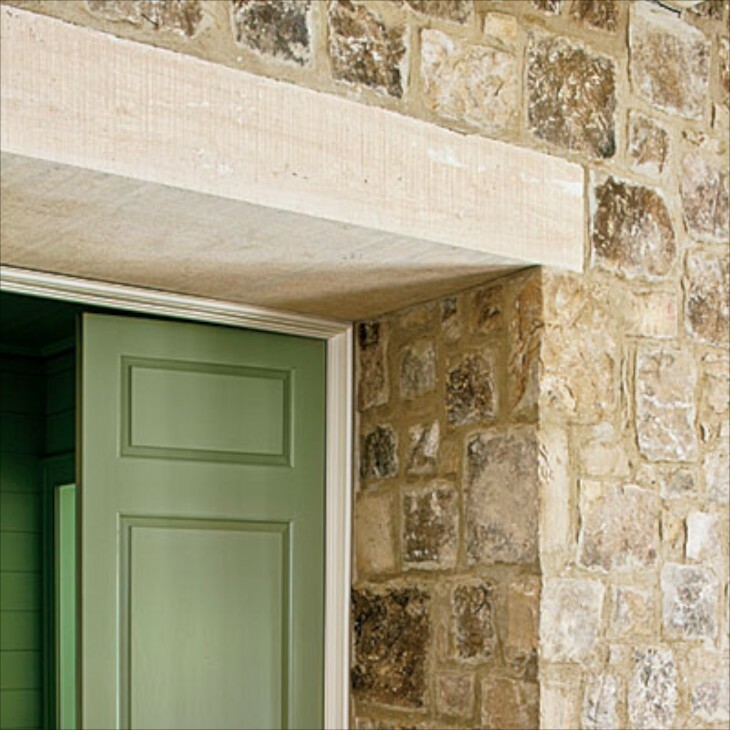 There is a certain character to a stone house that draws one in. I have always thought them special! Thanks for commenting.